This report investigates the claims of Russian involvement in the attacks leading up to and during the assault on Novoazovs’k between 23 and 27 August 2014. The report analyzes open source evidence to determine the source of artillery fire on Ukrainian units, as well as the origin of armored vehicles sighted inside Ukraine in the Novoazovs’k area. Evidence from social media and satellite imagery shows that artillery attacks and armored vehicles sighted in the area of Novoazovs’k in July / August 2014 came from Russia (summarized in Figure 1 and Table 1). Two artillery attacks on 23 August 2014 came from Russian territory, and two T-72Bs and one 2s19 Msta-S sighted in Novoazovs’k after its capture were transported from Russia. The report also provides analysis of other attacks in the Novoazovs’k area during July / August 2014, several with some (but not conclusive) evidence suggesting attacks from Russian territory. Figure 1. Summary of artillery attacks in the Novoazovs’k region, from 21 July to 26 August 2014. Red solid lines indicate the trajectory of artillery fire that has been matched to a firing point found from satellite or social media evidence. Orange lines indicate a trajectory estimated from photo or video at the attack site – the firing point is unknown. The green line indicates the movement of attacking forces after advancing across the border on 25 August 2014. In mid-August 2014, Ukrainian armed forces had pushed back the Russian-armed separatist forces to the areas close to the cities of Donetsk and Luhansk. Until this time, the area of the Donetsk region close to Novoazovs’k and Mariupol, overlooking the Sea of Azov, had been spared the worst of the fighting. Before 23 August 2014, Ukrainian forces had sporadically come under artillery fire (on 21 July, 25 July, 21 August); however, there were no clear signs of forces massing in the area at the time to threaten a large-scale attack. This changed on the morning of 23 August 2014, with large-scale and frequent artillery attacks on Ukrainian positions close to Novoazovs’k border crossing point (BCP), which continued over the next few days. By the morning of 25 August 2014, it was clear that towns along the Azov coast were now targets of the Russian-armed separatist forces. Using evidence from social media and satellite imagery, primarily from Yandex maps images from 31 August 2014, Google Earth images from October 2014 and TerraServer images from 2014 – 2015, we show that artillery attacks and armored vehicles sighted in the area of Novoazovs’k in July / August 2014 came from Russia. On 23 August 2014, Multiple Launch Rocket System (MLRS) fired from Russian territory struck a Ukrainian military base close to the town of Kholodne; more than 30 kilometers from the nearest position of the Russian-armed separatist forces within Ukraine. Soon after, another artillery system within Russia struck the same position. Later, two Ukrainian checkpoints on the road from Novoazovs’k border crossing point (BCP) to Novoazovs’k town were attacked by MLRS fire from a firing position less than one kilometer from the Russian border, with visible tracks leading back to a crossing point into Russian territory, and/or from a position within Russia. On 25 August 2014, satellite imagery evidence supports media reports and witness testimony that Russian-armed separatist forces crossed into Ukraine through a crossing point (visible on satellite imagery) north of Novoazovs’k BCP, and attacked Ukrainian forces to the east of the town of Novoazovs’k. On 25-26 August 2014, videos and photos show the aftermath of MLRS and artillery shelling of roads, houses, a cemetery, a bread factory and a hospital as Russian-armed separatist forces fought to take control of the town of Novoazovs’k. Figure 2. Sightings of tank number 127 / 005 in Russia and Ukraine during the summer of 2014. a), c) in a truck convoy 30 July 2014 close to Kamensk-Shakhtinsky  [1-archive]  [2-archive] [2-geolocation] [2-geolocation-archive] . 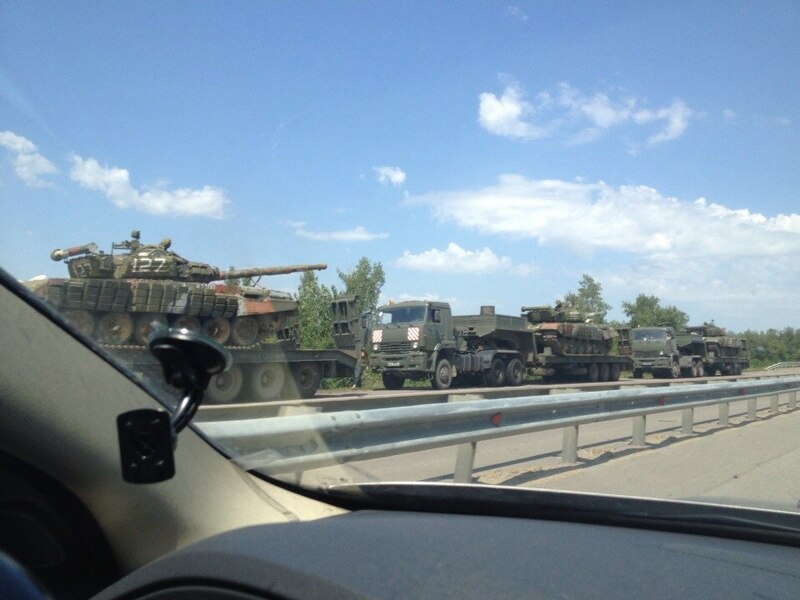 b) Another convoy carrying tank 127, photo uploaded on 21 August 2014 and taken in the area of Rostov-on-Don  . d) A photo of tank 127 in Novoazovs’k taken by journalist Petr Shelomovskiy on 31 August 2014  [4-archive] . e) A photo of tank 127 in video CONVOY-2 uploaded 10 September 2014, filmed at 47.126085, 38.084023  [5-archive]. The report also investigates the origin of T-72B armored main battle tanks (MBTs) and howitzers that were filmed or photographed close to Novoazovs’k after the town was taken. Building on previous work, we show that two T-72B tanks and one 2s19 Msta-S 152-mm self-propelled howitzer were transferred from Russia to Ukraine in late summer 2014. These two specific T-72Bs and the 2s19 Msta-S were sighted earlier inside Russia, demonstrating that these vehicles were of Russian origin. In summary, open source evidence shows that attacks on Ukrainian forces around Novoazovs’k came from Russia, and vehicles used in the conflict in the area were transported from Russia. This report adds to the growing body of evidence showing that Russia was directly involved in the Ukrainian conflict of 2014-2015. A. MLRS attack on Kholodne 23 August 2014 Russia Video of rocket launch. Video of Kholodne under attack. Firing point and attack craters located on satellite images. B. Self-propelled artillery shelling of Kholodne 23 August 2014 Russia Video of artillery firing site. Video of Kholodne under attack. Firing point located on satellite images. Trajectory analysis of artillery fire. C. Mortar shelling of Novoazovs’k border crossing point 25 July – 24 August 2014 Russia (unconfirmed) Potential firing site located on satellite images. Witness reports. D. MLRS and artillery shelling of checkpoints on road to Novoazovs’k 21 July, 23 – 27 August Inside Ukraine, Within 1 kilometer of Russian border Firing site located, and vehicle tracks leading back to Russia. A second potential firing position identified in Russia. Artillery trajectories determined from photos taken at attack sites. Crater trajectory analysis of satellite imagery at attack site. E. Armored assault from Russia on Novoazovs’k area 25 August 2014 Crossed border from Russia between Markyne and Shcherbak, advanced on Novoazovs’k Witness reports. Border crossing point, route of vehicle convoy and subsequent battle identified on satellite images. F. MLRS attack on Sedovo – Novoazovs’k road 26 August 2014 morning Ukraine or Russia northeast of Novoazovs’k – unknown Videos / photos of the attack site shortly after the attack. Crater trajectories analyzed from photos / video. G. Bread factory northeast Novoazovs’k artillery strike 26 August 2014 morning Ukraine or Russia northeast of Novoazovs’k – unknown Videos / photos of the attack site during and shortly after the attack. Crater trajectories analyzed from photos / video. H. Northwest Novoazovs’k artillery strike 26 August 2014 afternoon Ukraine – northeast of Novoazovs’k in are southeast of Rozy Lyuksemburh Videos / photos of the attack site during and shortly after the attack. Crater trajectories analyzed from satellite images. Potential firing point located. This report was written by Sean Case and Klement Anders, with significant contributions from Aric Toler and Eliot Higgins. Thanks to Pavel Aleshin and Dmitry Bochkov for assistance with the translation to Russian. Censorship and repression of free speech are more active in Ukraine than ever before. Even calling Bandera a genocidal murderer and Nazi collaborator, which he was, will get you jailed. hehehe.. just have come back, and immediately seeing an insomniac Randy Troll posting another delirious bull..
No average (or any at all!) Briton would be so hateful about Bandera, so the only conclusion is that this randy drool is really a terroRussian, perhaps living in Britain for a while, until his guts get expelled …. I had actually never heaard of Bandera before last year, but I did know many Ukrainians volunteered to be SS guards in concentration camps. If u want dig in history…. how many russians served in gulags? It makes no sense…if your only chance of getting money is to do a bad thing MANY poor and badly instructed peoples (anyone under certain circumstances) will do it if is the only way to survive. PS: if i remember correctly there were some strict requisites to become an SS…citizens of an occupied nation FOR SURE had none of them 😉 so you prove to be wrong with your claims one more time RANDY. Do not feed the Randy Drool, do not you see he is shifting the conversation towards ukraininans-fascists-blahblahblah typical verbal diarrhea topic of russian trolls.. There was an entire Ukrainian SS division, the Galizia SS Division. Ukrainians also volunteered to serve as guards in concentration camps as you can read in, among other books, ‘Schindler’s Ark’ (the book Schindler’s List is based on). Then there was Bandera and his O.U.N. gang which was involved in the genocide of Jews, Poles, and Russians. All Ukrainians assisting the Germans were volunteers. Your cover is blowing up , Randy Drool, booomm bada booom! Stand up in Red Square and say that about vova Randy. Or the ROC leader Kirill (however you spell it. And see if you even make it to jail. Or maybe Iran about Mohammed. When was you in Russia last time? And where do you get your knowledge about Russia from? It is a set of wild stereotypes kinda Cold War times. We all know that Russia puts nonviolent solo protesters in jail for 3 years. People can’t protest in Russia with more than one person without a license. Which they rarely acquire. Russia puts bloggers against the invasion of Ukraine in jail for 5 years. Mention the reasons for suicide, since many pensioners commit suicide for lack of medical care. Write about soldiers dying, even during peacetime activities. Where is the repression and censorship taking place? I guess not in your St. Petersburg office where you use a VPN to give you a UK IP address. Randy, go muck up some other website’s comment section, because nobody here believes you, except your office mates that also post here. Your post here just confirm to the average reader, that the Russian propaganda machine really exists. Are you refering to Soviet or Nazi concentration camps? Are you attempting to justify the Nazis and Ukrainian involvement in genocide by referring to the Soviet gulag? The USSR tanks are mostly T-72’s, with some T-90’s. They are not well-built tanks and cannot withstand TOW missiles, they have some reactive armour; but it’s USSR built armour; therefore high chance of the armour fail. Ukraine will sell anything it gets to terrorists. Ukraine cannot be trusted with any advanced weapons, which is why the USA has supplied Ukraine with only non functioning junk. Even the Iraqis have Abrams now lol. The war is over, the death toll is enough. Ukraine and all sides should implement Minsk agreements. Middle East seems far away, but not the eastern Europe – Europe would not allow US’ TOWs, Abrams and other scrap metal in the hands of Ukraine. Obama would not risk to ruin relationships with EU on the eve of elections. You’d call an Abrams tank, “scrap metal” if you were staring down the (loaded) cannon barrel…? May be Abrams is a good tank, I don’t really care. It is just not the time to call for a new military escalation. When would you reccomend “escalation” w/regard to Putin, who escalates on us constantly, while the West plays pick-up. Should NATO never re-inforce the Baltic States…? Put a radar in Poland or send troops there, why not…? We have the right, and we are in the right. It is Putin who now is breaking the INF treaty. He’s testing new ground-launched cruise-missiles. His advisors talk daily on the proposed use of even nuclear weapons. His aircraft contest western space, inside 12-mile limit. But, we must never “escalate” on that too, eh…? I meant more the current situation in Ukraine, and possible military escalation not only in Donbass but also against Crimea. That’s why the west doesn’t want to grant weapon, it is more than enough weapon already. But what concerns US-USSR agreements. The INF Treaty (intermediate-range nuclear forces) was signed in 1987 during US-USSR nuclear chase over Europe. INF Treaty covered also middle-range conventional missiles. I believe it is related more to missile carriers rather than nuclear. According to the agreement USSR destroyed 1846 missile complexes, US – 846 ones. The other agreement ABM Treaty (anti-ballistic missile) was signed in 1972. Both agreements can be logically understood only the context of that times and strategies. When USSR voluntary left Eastern Germany and the Berlin wall was destroyed, NATO promised Gorbachev personally not to extend to the east. Actually Gorbachev used to say that and then denied himself, so it is not very clear. In 2001 US withdraws with ABM Treaty and announces the deployment of anti-missiles in Poland and other eastern European countries. Officially it was claimed to protect from Iran, but it was understood that Iran doesn’t have such missiles and in the first turn it was implied to Russia. From strategic prospective that would ‘change the balance’, also who knows what those missiles would be actually capable of, anyway it was not considered as a friendly step. In the response Russian officials several times stated that Russia MAY withdraw with INF Treaty. The nearby countries India, Pakistan, Korea, China, Israel are not limited by such treaty and actually have middle-range missiles. Russia also claimed that US is actually developing such missiles and particularly unmanned planes can be considered as eligible. Nevertheless as far as I know Russia is not going officially to leave the treaty. And no foreign investors are going to invest any money in Ukraine either. They’d have to be nuts to do so. Actually Russia just had a record month for foreigners buying Russian shares. Capital flight from Russia by the Russian elite remains high, it’s just business, simply where they see the best future for their money. FDI in the Ukraine has gone up to 904 million in the second qtr of 2015. Guess there are a lot of nuts out there, eh Randy. Of course, this just puts your statement above into the circular file of non-sequiturs. German Panther tanks were just as unreliable, they constantly broke down due to inadaquate final drive gears. Panthers could not be safely driven at full speed. The USSR knocked out numerous Panthers with the 85 mm gun. Though it’s at times kinda funny, I don’t quite see the point in the extended discussions with particular commenters ranting about and around their personal POV. No consequence at all, waste of time and precious energy, and as a bonus gives people a forum that in real world might not even succeed in Speakers’ Corner, let alone some serious place. Ukrainian fascists and government involved in the theft of Old Master paintings, says The Netherlands. we all know full well that the Ukrainians hated the Soviets for what terrible things they did to them. Anyone joining the German army probably had good reason to do so, just as many other Eastern Europeans did. The Soviets were brutal masters under Stalin. One of the reasons many Polish troops surrendered to the Nazis instead of the Soviets in 1939. Of course, they were choosing between two evils, but one side was already well known for the brutality they could and did unleash. So, condemn the Ukrainians all you like Randy, but if you had seen your little sister or brother die of starvation, your parents reduced to cannibalism, your daily meal reduced to tree bark, grass and stones, perhaps you too would have seen the Nazis as saviors. However, in the mind’s eye of Markist/Leninists, this matters little at all since they feel things like the Gulag were justified. Right Randy boy? Ukrainians volunteered for the SS, including concentration camp duty, not the German Army. They ethnically cleansed western Ukraine of most of its Jewish and Polish population, by murdering them. What exactly did those actions have to do with hating the Soviets? Do you think Germans were nice to them? The ethnical question was major for nasi Germans, that was the clear difference with soviets. In fact one cannot compare them. Soviet policy has never been against Ukrainians, in fact Ukrainians were those who conducted those policies in Ukraine. We should not forget that majority of Ukrainians fought against Hitler in soviet army, partisaned at occupied territories (which has always been intrinsic to them up to nowadays :)) and together with others shared and deserved that victory. This is true. A great many Ukrainians fought against the Germans. I have perhaps been painting an overly negative picture. Yes, you have Randy. It is a very complicated situation, mainly due to the reasons I mentioned above and also due to the inherent racism seen in many countries in Europe…that includes both the USSR and the UK. However, many ‘volunteers’ hated the Soviets for several reasons, including, but not limited to the Holodomor. However, you are wrong in saying they only volunteered for the SS, since they were in German Army units as well, and although members of the SS, they mainly fought in the Eastern Front and none were ever accused of a war crime. The same concerns Russians and others under occupation ww2. 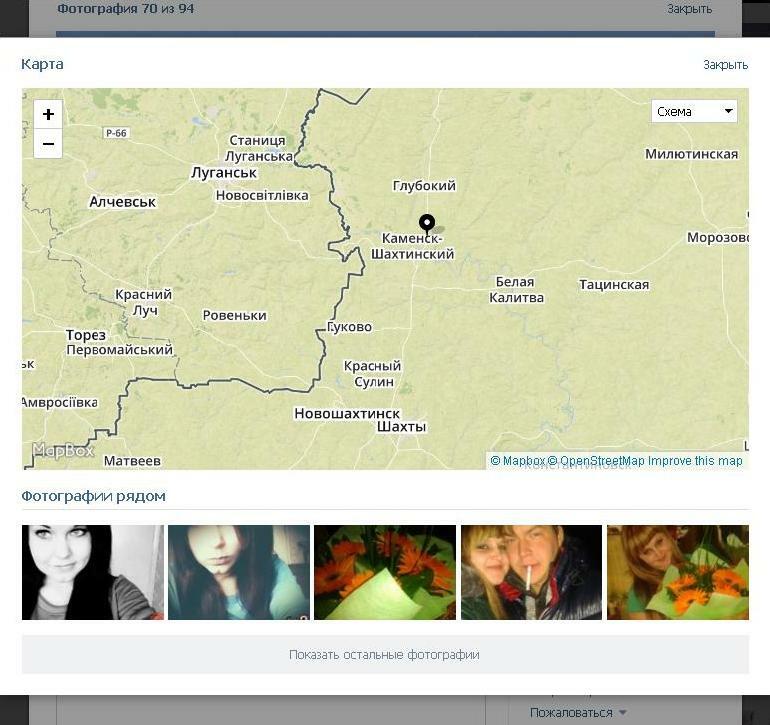 I didn’t mean anything against all Ukrainians. Just cannot agree that hitler came to liberate from soviets as well as the interpretation of femine of 30th as golodomor. Do you not moderate these comment threads? Why are these 2 allowed to engage in a flame war? Different points of view are interesting. I agree with what you said: insults, name calling, ethnicity, etc, should be refrained from. Just why are you naming 2 particular persons? You are more than welcome to start a interesting topic and sustain a civil discourse and I’m sure it will attract the right people. Which two people do you mean?? Western nations here are all in formal agreement; sanctions on USSR now extend well into the future. With oil &@ its lowest price in decades, 38US$/barrel, can we sit back and watch as a Palace coup unseats Putin, who (might be now seen by some USSR elites) as having too extreme an attitude to the West. “The U.S. response? We feel your pain.” 🙂 That is wise taking into account that EU business suffers from sanctions while US one may even benefit with the new Shale oil and liquefied gas transatlantic projects. BTW do you think that US indirectly is responsible to what happened in Ukraine by supporting the coup against the legally-elected former president mr. Yanukovich? Kind of reminds me of yanukothiefs pads that he got working on a manager salary down in Donetsk of about 30k a year, oh and 3 years as democratically (cough, BS, cough) elected President whose elections were also surrounded by voter fraud and bribed voters and over 300k voted who were not registered to vote in Ukraine. Stranger in my opinion when yanukotheif fled to avoid prosecution in Kyiv, he resigned his seat. They did impeach him after the fact. But he was not democratically elected any more then vova was elected in the last election cycle. That amount of fraud does not a democratic vote make. The responsibility for his ouster was the crimes he committed, the USA did not force him to do that. Although one could say the Kremlin did. 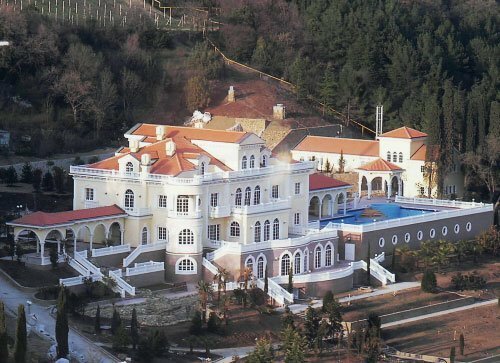 yanukothiefs homes, one can be seen by going to yanukovychleaks site. Yanukovich was not democratically elected? But who controlled and fraud elections for his sake during a previous ‘pro western’ president of Ukraine Yushenko? Are you saying there was no democracy in Ukraine before Yanukovich, during Yushenko? Also one need to take into account a historical separation of western and eastern Ukrainian regions, not enough for a war of course. But Yanukovich was eastern candidate, while all Ukrainian nationalists including Yushenko – from the west. The revolution was made mostly by the west, the east felt their interests were not honored. That corruption under Yanukovich is true, but not all the truth. Joe Biden recently visited Ukraine and talked from parliament, rada, as a master, accusing current Ukrainian government in corruption and calling not to loose the last chance to change. They could have just waited for 1.5 years and reelect Yanukovich, why they needed to overthrow? 100 billion of embezzlement and the complete dismantling of Ukrainian military in 3 years is not enough crime to wait? And you think he would get reelected? I agree Biden may know more then I do and Ukraine might be reverting to its old oligarchical ways. He has the USA treasury and other departments keeping a very close eye on Ukraine. Whether or not it is just a warning for them to keep combating corruption, or that organized crime is again already getting a bigger foot in the door, I do not know. Many Ukrainians feel it is getting better, but the white collar crime is still prevalent and the lack of results of Maidan shootings and Odessa investigations is alarming. They do not see the results, and they should be obvious they think. The Ukrainians have made headway, but justice is slow. That is one difficult thing about democracy, the victim rights side of the equation…no matter how guilty everyone knows they are. The need for kicking him out of office is obvious. He accepted the Kremlin loan and signed off on it regardless of everyone screaming no and voting it down. He signed the EU agreement initially, then the RF agent refused to recognize his signing and then stated himself after a consolation with the RF representative that he never signed it, even though he had many other witnesses there. In the 20 years or so since the fall of the Wall and signing of the Budapest Memorandum, democracy did grow, but it still remained a corrupt state. Both the East and West. Organized crime flourished, just as it did in Moscow. There are still the crime families throughout Ukraine. So no, I would not say a true democracy and will of the people expressed in the voting prior to Poroshenko’s election. I do think that was the most democratic vote in Ukrainian history. Previous elections were which group could corrupt more of the election board. Maidan was an advance of democracy and an establishment of the will of a majority of citizens against the past corruption. I think Western criminal elements jumped on that bandwagon hoping to hide under the shroud of democracy and get their people into as many positions as possible. They have been slowly pushed out and exposed. However it is still there, just not as obvious or dominant. Which can be seen by the acceptance of smuggling between groups on the frontline. Eastern crime groups are wide scale taking advantage and stealing everything that is not tied down and running to Moscow. As far as not listening to the East, well when the Party of Regions is basically a crime front for the ‘Family’, there is not really a whole lot to listen to. Especially when they say we are going to steal Eastern Ukraine and run away to Russia with it, the same way they did in Crimea. That was mostly a RF Kremlin action, not a true representation of the will of the people in the East. We saw both types of demonstrations in Donetsk and Luhansk, for and against unity. The will was for unity, and their voice was heard and supported. Then booom, FSB and GRU agents broke into police stations, freed jailed Russians, broke into banks, broke into government offices, and broke into military bases and stole everything they could to escalate the crisis. Sure there were a few organized crime families supporting that action, a handful of Ukrainians, but by and large it was a Moscow led operation. The demonstrations for Unity should largely the will of Eastern Ukraine. To deny it, you just have not looked hard enough or turn off the channel when the facts stare at you. Just as Crimea was 100 Crimea citizens roughly, and the rest were Russian military and various agents of the Kremlin, so was Eastern Ukraine. You really have a lot of nerve if you supported the Crimean referendum and its results – all blatantly illegal, rife with fraud and against international norms – and you are pointing out they should have thrown him in jail, impeached him, then hung him…or just waited 1.5 years. The changes that he implemented to the constitution of Ukraine made that removal of him from power more difficult and his prosecution as well. I wish they would have caught him as he ran away and gave up office, I really do. I wish Ukrainian military and the Interior Ministry (remember he killed himself instead of being exposed for his crimes, snipers maybe? ) itself would have stopped yanukothief and arrested him in his first year. And all the while the Party of Regions endorsed and encouraged his criminal escapades. yanukothief, and a few others, deserves the hangman’s noose for treason and other crimes. His crimes and the Party of Regions endorsement of those crimes were the cause of Maidan, and not some USA orchestrated coup. Because corruption has always been in eastern countries, Georgia, Ukraine, Russia. That is not right, but that is not the only factor. That is used by propagandists as a joker taken out of a sleeve whenever they want to justify why they need ‘to change a regime’. Are you saying us an eu may help Ukraine to rebuild and get rid of corruption? Hardly, will see how you would manage to help Ukraine, instead of pushing down Russia. IMF has already changed their rules to allow Ukraine not to pay sovereign debt 3bil to Russia, a good start, will see if it helps.